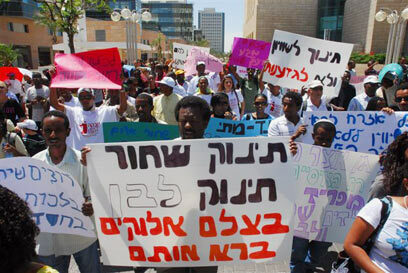 Some 200 parents and children gathered outside the government offices in Beersheba Tuesday to protest against racial discrimination in the city's Otzar Chaim kindergarten. The demonstrators claim the kindergarten has two separate classrooms – one for children of Ethiopian descent, and another for the others. Community representativesalso attended the protest and attempted to block a nearby junction. According to the parents, children of Ethiopian descent are kept in a completely separate building from the "white" children, and have a separate staff attending to them at all hours of the day. The kindergarten is not divided into different age groups, but caters to infants and older children. Meanwhile, a nearby kindergarten is divided, as required, into different age groups. The parents protested against the conditions in which the say their children are kept, adding that the area used for the Ethiopian children is in dire condition and the structure and its equipment are not fit for use as a kindergarten, as opposed to the situation in the nearby facility. "The children sleep on the floor in separate rooms," Farnus Lacka, a mother to one of the children said. She noted that the Ethiopian kids are forced to use different cutlery and added that she reported the matter to the Beersheba Municipality but was not taken seriously. "I'm surprised that the Industry, Trade and Labor Ministry and Education Ministry do not severely punish the people who act this way," Itzik Dassa, director of the Tebeka foundation, said. He noted that the government should immediately halt all funds for such institutions. The foundation approached Education Minister Gideon Sa'ar and Industry, Trade and Labor Minister Binyamin Ben-Eliezer this week in an appeal to put a stop to the phenomenon. Attorney Yael Segal- Machlis, director of Tebeka's legal division, accused the Education Ministry of lack of enforcement which allows the racism against young children to go on. The Industry, Trade and Labor Ministry said in response that its Beersheba district daycare director has visited the site twice and instructed the facility's management to immediately integrate immigrant children with the rest. An additional visit she held on Monday indicated that no separation was being maintained, the Ministry said. See all talkbacks "Ethiopians protest racial segregation "